The promotional machine behind Rogue One: A Star Wars Story is in full swing now, and the the wizards at Disney just came up with a truly remarkable way to spread the word about the film. 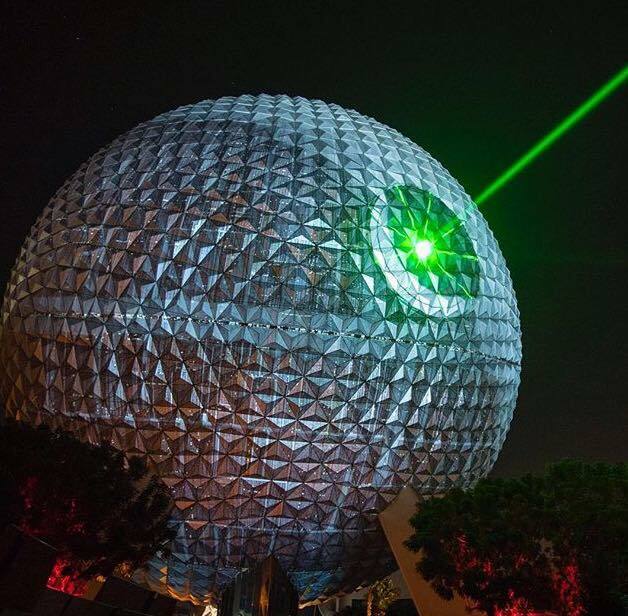 Last night at Walt Disney World's Epcot park, at a special after hours event hosted by the Disney Parks Blog, one of Disney's most iconic landmarks, Spaceship Earth, was (briefly)transformed into the Death Star! In the lead up to the big reveal, veteran Star Wars Celebration host Mark Daniels was on hand to introduce several awesome guests and some stunning reveals. Disney show director & writer Michael Roddy took the stage to announce that Death Troopers would be joining the "Star Wars: A Galaxy Far, Far Away" show, as well some new Rogue One additions to Star Wars Launch Bay, and the reveal of a Star Wars guided tour. Next, Mads Mikkelsen, who plays Galen Erso in Rogue One, took the stage to discuss the film and revealed a brand new clip featuring himself and Orson Krennic(Ben Mendolsohn). Later, an Imperial Officer, flanked by Stormtroopers and Death Troopers, arrived to make the Death Star "fully operational".